High ceilings a cable TV and a stone fireplace are featured in the spacious living room of this three-bedroom Tahoe City house. Lake Tahoe is 10 minutesâ?? drive away. Free WiFi is provided. Barbecue facilities are featured in the fenced backyard. 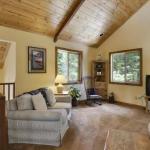 Two en suite bathrooms free WiFi and a full kitchen is provided at Woodacre Home by Tahoe Vacation Rentals. Cycling hiking and skiing opportunities are nearby. Free parking is provided at Tahoe Vacation Rentals. Alpine Meadows Ski Resort is 15 minutesâ?? drive away from Woodacre Home by Tahoe Vacation Rentals. Reno-Tahoe International Airport is 1 hoursâ?? drive away.